Stephen's ultimatum, "If he stays on here I am off," echoes events at the beginning of the Odyssey. Telemachus attempts to get rid of the suitors, and fails. 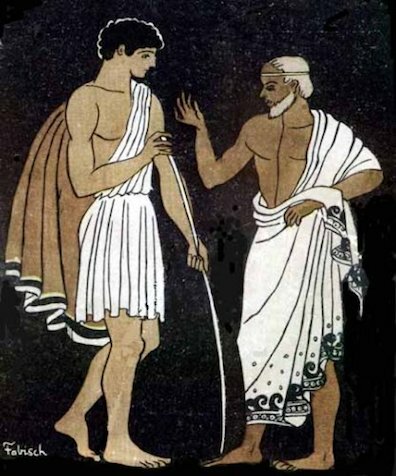 Athena, in her disguise as Mentor, advises him to overcome his impotent dissatisfaction and take action, by leaving Ithaca to go looking for news of his father. Similarly, Stephen feels excluded and demeaned by Mulligan's alliance with Haines, and resolves to leave. Pablo E. Fabisch's drawing of Telemachus and Mentor in a modern edition (Buenos Aires, 1956) of François Fénelon's The Adventures of Telemachus (1699). Source: Wikimedia Commons.